Welcome to the daily analytical report about the Steem blockchain. All the information presented in this report are based on the data collected from the blockchain until 2019-03-09 midnight UTC time. 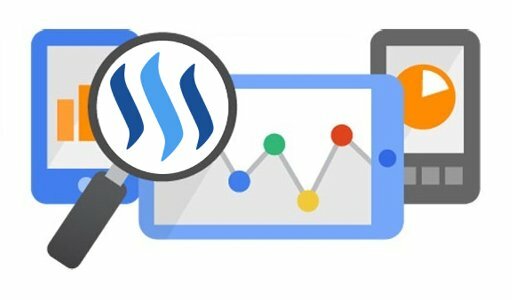 The goal of this report is to provide you with a clear view on what is happening daily on the Steem blockchain. This chart shows the number of newly registered users on the blockchain and how many of them became active. We see that a lot of accounts are registered, but never used. Warning: this graphic is kind of dynamic! A user can register one day and become active a few days later. Therefore, the number of active users on a specific date may change from day to day. In this graph, the orange line shows the total number of registered accounts. The green line shows how many of them have been active at least once (by active users, I mean those who made at least one post, comment or upvote). They are included even if they become inactive later. These graphs show the activity of users over time and in more details for the last 30 days. They use the same definition for active user as stated above. The last graph is a monthly summary of the active users. It allows you to compare values from the Steem blockchain to those one usualy published by other social networks. These graphs show the evolution of posts and comments for the whole blockchain lifetime and for the last 30 days. These graphs show the evolution of curation (upvotes) for the whole blockchain lifetime and for the last 30 days. This graph shows the number of daily transactions. This give you an idea of the whole activity on the blockchain. This graph shows the tag has been the most used for publishing posts for the whole blockchain lifetime. This graph shows the tag has been the most used for publishing posts last day. This graph shows the distribution of the reputation among users. Accounts with a reputation lower than 25 have been removed to keep the graph readable. This graph shows the number of users according to their voting power (it now includes the new "Inactive" and "Red Fish" levels - check @steemitboard blog for more info about this). This graph shows cumulative distribution of the voting power. It enables to see the total voting power of each level. These graphs show the maximum reward paid on a post (or comment) for each day (whole blockchain life and last 30 days). These graphs show the total of the distributed payout (posts and comments) for each day. 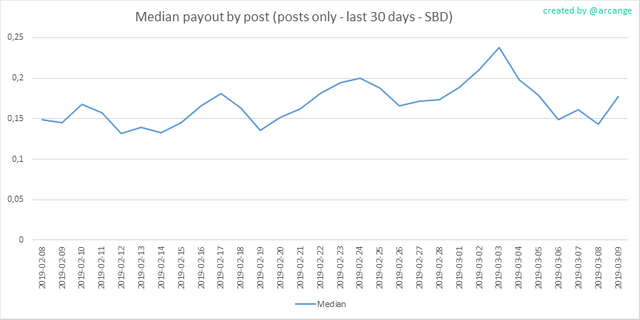 These graphs show the average and median payout per post for the last 30 days. The last one indicates that if yesterday you got the latest value shown on this chart for your post, you should be happy because there are as much people that have earned more than you than people that have earned less than you. I hope you find those stats useful. If you would like to see different stats, feel free to drop me a comment. Your feedback is more than welcome. Your UA account score is currently 7.924 which ranks you at #37 across all Steem accounts. In our last Algorithmic Curation Round, consisting of 225 contributions, your post is ranked at #9.